Digital learning team utilized Google Expeditions as a learning tool for the virtual reality headsets. 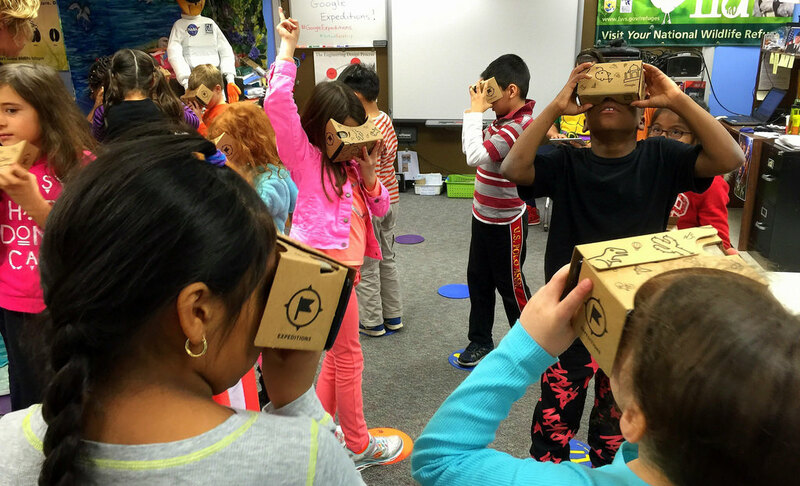 NEW BERLIN, Wisconsin – Students at Ronald Reagan Elementary in New Berlin will get to explore a whole new (virtual) world this year, thanks to a new set of Virtual Reality headsets. Through last year’s Boosterthon, glow run and help from the Parent and School Association, the school was able to purchase a full classroom group of VR headsets, which can be used to dive — visually — deeper into what students are learning about, using Google Expeditions. For those not familiar with virtual reality, imagine being plunged into a three-dimensional movie that feels like it surrounds you. When wearing the headset, you can turn your head and see things from different perspectives.